https://www.kipling-usa.com/darcey-medium-rolling-luggage/100130236.html Darcey Medium Rolling Luggage The Darcey Medium Wheeled Luggage is a sensational suitcase that is easy to transport from one destination to the next thanks to its four ready-to-roll wheels. Its soft grip handles, trolley handle, and front pocket offer must-have functionality to keep you organized while traveling. Plus, stand out at baggage claim with a monogram! We have had many of your bags the size of Darcy but this is the first one we are very unhappy with. We much prefer the little firmer structured bags of the past We could not return it because we personalized it. Wished you had not changed the style. Light weight and great capacity! Love it!! Just got back from a trip abroad - used on airplanes as well as trains. Lightweight and easy to maneuver. Highly recommend!! !I got pink so it got a little dirty ☹️, my husband got black so his showed no dirt. I love it!,simply chic and spacious. I already have the carry on and large size ,so now my travel buddy set is complete. I needed a bigger travel bag - I have 2 of your bags already but they are the smaller ones. A co-worker had this bag and I saw it and used it and had to buy my own. Nice looking and my husbands favorite. 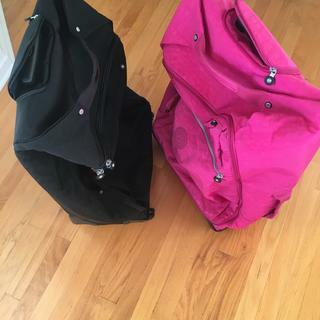 I have the matching carry on and the large one that I like a lot but the large one is too big for the new airlines restrictions on the weight. I pack it too full and too heavy. I need a smaller one that I won't over pack. How many litres in capacity for the medium size luggage ? This luggage has a 60L capacity! I am speaking of the extra pockets being created inside of the luggage where people put their miscellaneous things such as toiletries, battery charger, socks & etc... Almost every other luggage are designed like that. The capacity of the luggage is great and the weight is fine. I was able to pack 45 pounds in my suitcase.